"I think there's something particularly 'Kelela' about starting on a somber note;" this is how Kelela introduces her sublime, shape-shifting new EP, and in particular the cavernous tumble of its first song "A Message." While the track continually falls to pieces and puts itself back together again, Kelela duets with a disembodied spectre of herself recounting the emotional purgatory of a newly abandoned relationship. It's more than an opening song, it is the moment that launches the narrative arc that is the backbone of the EP, titled Hallucinogen. Kelela expands, "It speaks to the narcotic that is loving someone. It makes you exhilarated, it makes you feel drained, it's in your body and it affects you so completely", and thus the record opens with a pair of tracks that conjure the feeling of emerging from an opiate haze and into the light of the EP's middle section. "Gomenasai" is a stunningly low-slung piece of grime-influenced futurism, with Kelela buoyed by Nguzunguzu's MA on production. "I think it's more honest and realistic to start with the ultimate low, but equally there has to be hope, and this is where "Rewind" comes in." Co-produced by Kelela/Kingdom/Nugget, "Rewind" perfectly embodies the breathless euphoria of infatuation. Kelela steers some mutant form of Miami-bass-freestyle-electro to a sweaty basement rave where furtive companions lock eyes across a chaotic dance floor. "All The Way Down" (prod. By DJ Dahi) follows, and the timid interactions are replaced with an empowered courageous nerve…the decision to go all the way in love again, despite having dealt with heartbreak. By the end of the song Kelela's voice has become a submerged, pitch-shifted blur asking "what you wanna do?" Rather than answer her question, the title track brings up many more. "Hallucinogen" might be the most aptly-titled track you hear this year, a queasy psychedelic odyssey in which Kelela intones like a wordless shaman while the world literally shatters around her. Born out of the same series of sessions with Arca that begat "A Message," Kelela's instinctual harmonizing dances around the beat, telling the story of ecstasy through impulse, with sounds and shapes rather than lyrics. 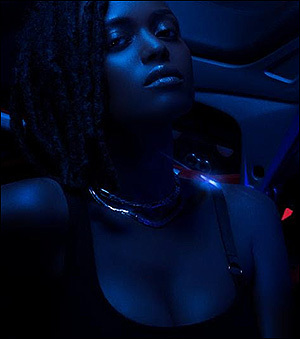 The 'reset' button has been hit and the glow has faded as a monochromatic chopped-and screwed techno pulse by Gifted & Blessed carries Kelela through the euphoric peak on "The High", an indulgent surrender that leads to a restarting of the cycle, "then you go straight back into 'A Message' from 'The High' – from hedonism to heartbreak – it's very much a continuum." Hallucinogen represents a turning point for Kelela, marking only the second release of her ascendant career after the out-of-nowhere runaway success of the Cut 4 Me mixtape that made her name. As an artist Kelela plays a role not unlike that of her longtime fan Bjork, orchestrating the electronic avant-garde in pursuit of her unique vision. "I'm pulling things out of people to create a culture clash in me. I've spent so much time synthesizing inside myself to realize the songs." Kelela developed her approach singing over experimental instrumentals thinking to herself, "is there a place for a weird black girl in this music?' – I had to make sense of these two things inside myself, the color of my voice in all it's R&B glory and all the other music that was resonating with me." With this EP, she has made that place – pulling the parts together under the umbrella of Kelela, incorporating different voices and inspirations, from Janet to Wiley, from Tamia to Aphex Twin- a universe Kelela is building for herself. With her album epic well underway, Kelela's vision of progressive soul music is about to shine very bright. Hallucinogen is a strikingly realized piece that brings that into sharp focus.